Entice food-loving Singaporeans into your restaurant with these well-loved local ingredients. Want to make your dishes more “Singaporean” without actually having to include Rojak or Mee Rebus on your menu? A simple way to infuse a dose of Singaporean flavour into the meals you serve is to create dishes using ingredients that locals can’t get enough of or add these ingredients into your existing recipes. Here’s a look at some of Singaporeans’ favourite ingredients! Since late-2015, this ingredient has been appearing practically everywhere on the sunny island – from bakeries to zi char stalls and local buffets, even McDonald’s. This ingredient is now very popular among local diners. 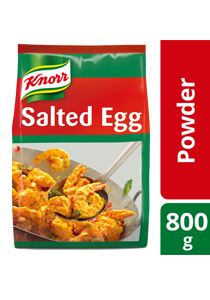 Try including salted egg yolk paste in various dishes on your menu and serve while it is still hot and oozy to impress your diners. Need an idea to get started? Try this Creamy Salted Egg Chicken recipe that’s been getting rave reviews from our chefs and friends! If you’re feeling a little more adventurous, we have two more tantalising salted egg yolk recipes for you in our “Related recipes” section! Gula melaka could be the single most versatile dessert flavouring ever to grace our nation. You can use it to flavour your ice kachang, sago or even pudding recipes –the possibilities are endless! Unlike sugar, gula melaka sweetens your desserts intensely with a unique tinge of coconut aroma well-loved by many Singaporeans. But why stop there? Pour gula melaka over your baked goodies and cakes too, for a sweet finishing touch, or mix it into your baking batter directly to create gula melaka chiffon cakes that are extra “power”! Despite its reputation for being unhealthy with its generous fat and salt content, luncheon meat remains a favourite among Singaporeans from all walks of life. Although it is most commonly eaten at breakfast, this flavourful treat can be consumed at any time of the day, with bread, rice, noodles or even on its own. The king of fruits is also the king of ingredients. Due to its strong aroma, durian is only selectively used in cooking. Yet, when used, it delivers a punch of intense flavour and aroma that will attract any local durian-lover within a hundred metres. You can try adding durian to your desserts, baked goods, and even in buffet dishes. Sometimes, just the thought of trying out a new variety of Mao Shan Wang Ice Cream could attract Singaporeans to your restaurant just for a taste. If your restaurant or hotel serves buffets, having durian pengat as one of your desserts is often enough reason for diners to pay the full price of your buffet!